A look at varicose veins and leaky valves below will aid in understanding the underlying cause. The leaflets in leaky valves are unable to form a tight seal, and allow blood to trickle down to the feet as gravity takes hold. Blood pools towards the lower part of the legs, increasing the load on the leg veins. This added pressure causes varicose veins to bulge and become visible. Symptoms such as leg pain, throbbing or heaviness are common. Itching and burning over the varicose veins, cramping, and leg swelling are also typical symptoms. If left untreated, complications related to blood clots can occur, along with skin breakdowns known as ulcers. Prevention is key and is straightforward to achieve. This gentleman presented with symptomatic varicose veins. He was diagnosed with venous insufficiency (vein valve leak) and treated in two steps. The first was an ablation to close off the leaky vein segment followed by microfoam sclerotherapy. A beautiful result and resolution of symptoms. We thank our patient for allowing us to post his results online. Very active gentleman who’s daily living activities including exercise have been slowed down due to symptomatic varicose veins. 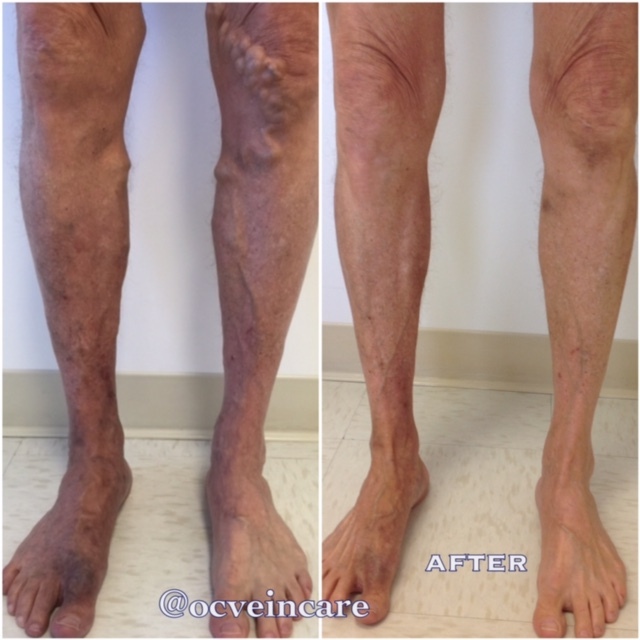 He received two ablation treatments and microfoam ultrasound guided sclerotherapy of the varicose veins. A dramatic difference in eliminating his symptoms of painful, achy varicose veins and clearing up his veins and leg pigmentation. His treatment is ongoing. Non-surgical Microfoam Sclerotherapy. Patient was able to achieve a less congested appearance with resolution of skin darkening. Varicose veins microfoam sclerotherapy treatment using the FLEX VeinViewer allowing real-time observation of the treated veins. Varicose veins seen to spasm immediately upon treating. Our board certified Vascular Surgeon, Dr. Maraya Altuwaijri, will outline and explain the best treatment options for you during your initial consultation. Varicose veins are bulgy, bluish veins that are visible throughout the legs. They are typically felt above the skin level and may form twisty, ropey patterns. Most varicose veins do not cause any symptoms however, some may be painful, red and firm to the touch. Such varicose veins may be inflamed and knowns as thrombophlebitis which are veins with clots within. A duplex ultrasound of your legs will identify how blood is moving through your veins and whether the leg veins’ valves are leaky. Leaky valves cause a higher pressure in the venous system with blood flow pooling towards the feet instead of returning efficiently for re-circulation by the heart. High pressure within leg veins caused the appearance of varicose veins along the different areas of the legs. Leaky valves may also cause symptoms such as leg pain, tired, fatigued legs, throbbing, ankle swelling, restless legs and cramps. Dr. Altuwaijri will identify any leaky, abnormal valves through the ultrasound, and recommend a course of treatment. Treatment is in-office, on average less than 30 minutes using the latest non-surgical methods and without any downtime. Insurance covers most medically necessary varicose vein procedures. Our office will call your insurance for benefits and outline the details prior to proceeding with a pre-authorization. Varicose vein procedures are performed in Dr. Altuwaijri’s Laguna Hills office and require no downtime, allowing you to return to everyday activities immediately. The treatment of varicose veins and the underlying cause is a permanent solution with excellent long term results. Each patient will be evaluated by a comprehensive history and physical examination with emphasis on the vascular system. If symptoms are present, an ultrasound is advised to map your leg veins and look for leaky valves in the leg veins which would explain the presence of varicose veins and symptoms. Next, a customized plan of treatment will be offered based on the ultrasound results. At OC VeinCare, the latest minimally invasive catheter based procedures are offered. The procedure is known as the Venefit procedure. A numbing cream is applied followed by the closure of the leaky leg vein within 30 minutes or less. Following the procedure, patients may resume normal daily activities immediately. Varicose veins are then treated non-surgically with medical sclerotherapy. A foam solution is injected under ultrasound guidance into the varicose veins. Again, no downtime is required. All procedures and ultrasound testing is carried out in our office. We are an accredited vascular laboratory by the American College of Radiology and offer daily diagnostic ultrasound and follow up studies. Venefit catheter treatment for varicose vein and symptoms of venous insufficiency (vein leak). Skin numbed up with numbing Lidocaine cream. A small ‘spaghetti-size’ catheter treats the leaky vein with radio frequency energy by permanently closing off the vein. The length of treatment is under 2 minutes. A small steristrip (adhesive) is applied. No sutures needed as the incision is very small measuring 2-3mm. Return in three days for a post procedural ultrasound.